There were a total of 129 entries in the fourth flight of the $400 No-Limit Hold'em Re-Entry Event #11. The field will play down to the final 16 players before bagging and tagging later this evening. Those 16 players will join the 24 advancing from Flight A, the 15 advancing from Flight B, the 13 advancing from Flight C, and any that advance in Flights E and F, and will return to play Day 2 on Wednesday March 29th at 12:00pm. Here is a look at the 13 players advancing to Day 2 in the money from Flight C of the $400 No-Limit Hold'em Re-Entry Multi-Flight event. These 13 players will join with the 23* from Flight A, the 15 from Flight B, and any advancing from Flights D, E, and F, and will return to play Day 2 on Wednesday March 29th at 12:00 noon. With 8:51 seconds left in Level 18, play has concluded for Event #11, Flight C. The 13 players are now bagging up their chips for a night. A full list of all advancing players will be posted in the next hour. The final 14 players are now on the bubble. They will play down to 13 before bagging and tagging for the night. Poker Pro Cory Waaland is probably most well known for success in the World Series of Poker Circuit events. Waaland has seven WSOP gold Circuit rings to his name, the third highest in Circuit history. There are currently three players tied with nine rings, two that have earned eight rings, and Walaand is the only player to have earned seven total rings, and he has amassed them in just fives years' time. 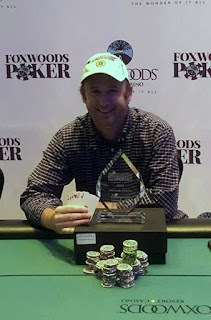 Walaand decided to make an appearance in today's Foxwoods Multi-Flight Re-Entry Event #11 (Flight D) to take his chance at the $250,000 guaranteed prize pool. Walaand isn't the only pro that this series has attracted. A few days ago Vanessa Selbst tweeted out that she too will be returning to Foxwoods next weekend for the $2,200 No-Limit Hold'em Championship event, and potentially the $5,000 No-Limit High Roller Event. Selbst has just under $12,000,000 in live poker earnings, and is the first and only female to have won three WSOP bracelets in open-field events. It's also been rumored that poker pro Galen Hall will return to Foxwoods next weekend for the bigger events at the end of the series. Hall has over $4 million in earnings, and won the Bahamas PCA Main Event back in 2011 for a monster $2,300,000. As per usual, Foxwoods continues to draw some of the biggest names in poker with their amazing structures and huge guaranteed prize pools. Players will soon head out on their first 15 minute break of the day. There are 86 entries at the moment, but registration is still open until the start of Level 9 (around 8:30 pm Eastern Time). At the moment, there are 28 of the original 104 runners remaining in Flight C of Eevnt #11. Those 28 players are currently playing Level 14 (1,000/2,000 blinds and a 300 ante), and the average chip stack is 74,285. Play will continue until they reach the final 13 players (12% of the field). Those 13 players will then bag up for the day, and return in the money on Day 2, Wed. March 29th at noon. There were a total of 72 entries in today's $300 Stud Hi-Lo 8+ event, generating a prizepool of $18,158. The top 9 places will make the money, with first place taking home $5,448. There were a total of 104 entries in the third flight of the $400 No-Limit Hold'em Re-Entry Event #11. The field will play down to the final 13 players before bagging and tagging later this evening. Those 13 players will join the 24 advancing players from Flight A, the 15 advancing from Flight B, and any that advance from Flights D E, and F, and will return to play Day 2 on Wednesday March 29th at 12:00pm. Here is a look at the 15 players advancing to Day 2 in the money from Flight B of the $400 No-Limit Hold'em Re-Entry Multi-Flight event. These 15 will join with the 23* players from Flight A, along with any advancing from Flights C, D, E, and F, and will return to play Day 2 on Wednesday March 29nd at 12:00 noon. All Flights Combined Update: The chip leader of this flight (Flight B), Ryan Mostafa, is fresh off his win in yesterday's Event #10 ($250 Super Stack Turbo Event). He is now not only the chip leader of Flight B, but also the overall chip leader of both Flights A and B. Ryan Hemingway, the chip leader of Flight A is coming in second overall in chips with 434,000. Both Hemingway and Mostafa are the only two players to have bagged over the 400k chip mark so far. The next closest is Jason Calnan who bagged 365,000 in Flight B. Stay tuned here at FoxwoodsPoker.com as we bring you all of the updated numbers for this event as it progresses.